iPhone users are very familiar with the world of emojis, and now we know which one is the best. Amongst them all, the “LOL” emoji is the clear winner for English-based users. According to Apple’s “Differential Privacy“, the “Heart” emoji was the runner up, while the crying face, the “in love” face, the kissing face, the rolling eyes face, the skull, the basic smiley, the despairing face and the “hmm” face bring up the rest of the pack. Out of the top 10 emojis, only one of them was not a face (assuming the skull emoji counts). Also, all of these emojis are “older” emojis we have grown to love. But with Apple’s most recent update, bringing in 70 new unique symbols and characters, this list could very well change. Apple routinely collects information like emoji usage to help improve features, but it insists the data does not include “any identifier, and IP addresses are not stored.” It uses a complex algorithm to identify emoji and then randomizes data so as not to directly identify any one user or their message content. In addition, Apple retains this aggregated data for a max of three months. 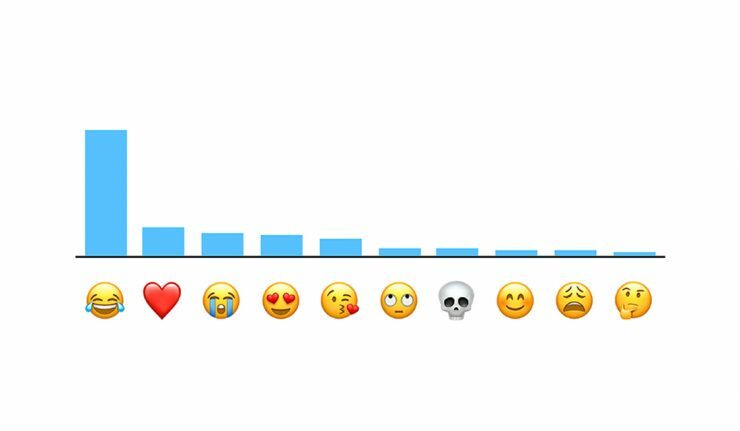 What do you think about the report of the most popular emojis? Did this list take you by surprise? Let us know what you think about these findings in the comments below!